Now every music fan has the chance to listen to what only a handful of people have ever heard: the oldest recordings of banjo songs in existence, played by an African American veteran of the minstrel stage, Charles A. Asbury (ca. 1857-1903). Born in Florida but raised in Georgia by a Baptist preacher, Asbury played Sambo in stage productions of Uncle Tom’s Cabin before becoming a noted vocalist with the original Unique Quartette and a celebrated banjoist on the vaudeville stage. His banjo songs were popular in phonograph arcades all over the country in the early 1890s, years before phonographs went into people’s homes. He did yeoman work for the infant phonograph companies–churning out wax cylinders, a few at a time, for seven years–before disappearing abruptly from the annals of the stage and recording history. Did he fall ill? Was skin color a factor? 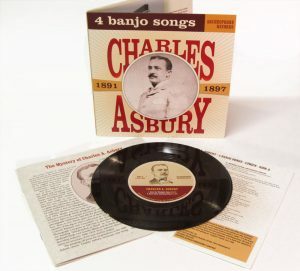 The booklet accompanying this record unsnarls, for the first time, these mysteries about Asbury’s background, ethnicity, and the era in which he both flourished and foundered. Another milestone is the use of CPS1–the first fully-integrated cylinder playback system–to transfer these rarities. Thanks to this recently developed technology, paired with careful restoration work, the stunning clear sound of these rarest of the rare wax cylinders from 125 years ago is finally heard. The oldest recording on the set dates to about 1891, making it the oldest known banjo recording in private hands. 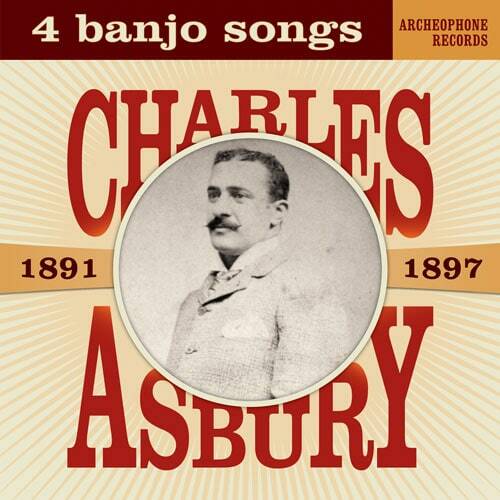 Asbury played in the old minstrel “stroke” banjo style that virtually disappeared from the vernacular and has only in recent years been rediscovered and reinvigorated by scholars of American banjo music. Grammy-nominated authors Richard Martin and Ted Olson document both the previously unknown history of Charles A. Asbury and his style of playing, as well as his place in the tradition. This is a seven-inch mono 45-rpm vinyl EP, housed in a double-pocket gatefold sleeve, with a lyric sheet and sixteen-page full-color booklet. The Grammy-winning production team of Meagan Hennessey and Richard Martin, in collaboration with John Levin and Ted Olson, have created a beautiful little set that packs an outsize punch. Learn about the CPS1 Cylinder Playback System used to transfer these rare cylinders.